RowShare Business Administrators and Billing Managers can access the Plan and Billing tab of their subscription management page. 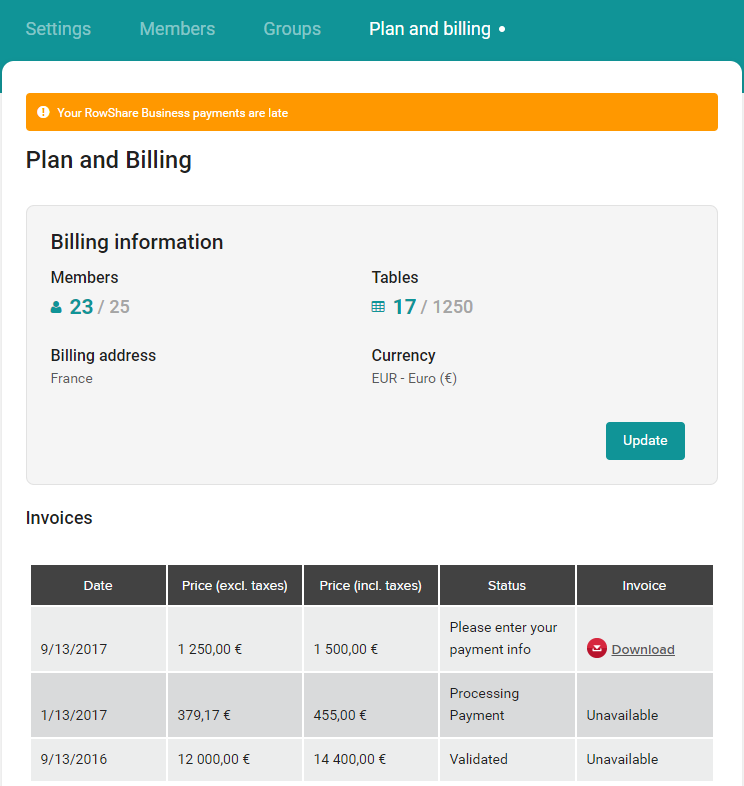 The first section lists key information about your subscription : number of active and maximum number of members and/or tables, your billing address and billing currency. This section also lets you change your billing address, payment mode and members/table maximum count. RowShare invoices you a number of members or tables every month or every year. You can change this number at any time. for monthly subscriptions, it will be reflected in your next invoice, which means that you will not pay the additional members or tables during the current subscription month. for annual subscriptions, you will immediately be invoiced the extra members or tables at a pro-rated price depending on how long your annual subscription is still running for. You can decrease your team size at any time as well. The decrease will be effective at the time of your next invoice, so that you can benefit of your extended team for the period you have already paid for. Inactive and Read-Only users do not count against your Team Size / Maximum number of users. If you would like to stop your RowShare Business™ subscription, click Unsubscribe. Your subscription will then expire at the next invoicing date. Your RowShare Business subscription remains fully functional until then. During that time, a new option is available: Cancel request to unsubscribe. This reverts to the previous state and your next invoice will happen as scheduled. If you are not in trial period, this area displays an estimate of your next invoice: the period it will cover, the estimated amount and the invoice date. When your subscription is deactivated, you no longer have access to your tables and folders, but your data will be retained for a period of three months. You still have access to RowShare Business Settings to change your plan or update payment details. If you do not know why your organization has been deactivated, please contact our support team. Where do I find my last invoice? How do I unsubscribe from RowShare Business? Is there a maximum number of rows per RowShare table?